This card was made as a special request, and I was happy to oblige. 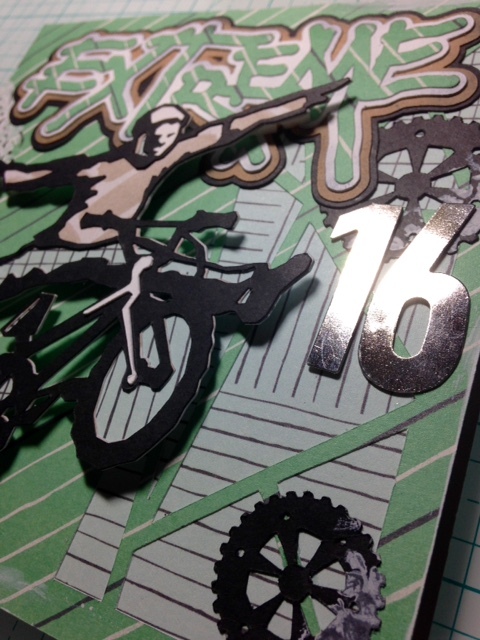 As it is titled, it is for an Extreme 16, and I was happy to be able to easily design and make the entire thing with my Cricut Explore Air 2! I used Ranger Distress ink in Vintage Photo, a WeRMemory Keepers embossing folder from the Geo collection, and metal numbers from my stash. The distressing in white that left "Treads" all over the outside of my card were made using a tread cutout as a stencil and white gesso. I also drew the small details of the tread on the exterior with a black sharpie for contrast. I was also able to make the inside banner with my Cricut's Write and Cut feature. I love how easy it is to attach words to images and let the machine do the writing! The papers made this card very easy to put together they are from the Fancy Free collection by Pink Paiselee, as well as Kraft cardstock and black paper from Recollections. I hope you enjoy this masculine birthday card. I am thrilled with the results!